Sharing options include Bluetooth file transfer, NFC-enabled tap+send, messaging, email, Facebook and the cloud-based SkyDrive. Unlike competing services you can also browse a specific artist and even buy songs to keep if you like. There are plenty of charts (e.g. Top sellers, Best of 2013, Songs for Fall) if you're looking for something new too. The music hub has a simple and straightforward interface. You won't have any difficulties using it. However there are some things missing, like an equalizer. Another missing feature is the ability to scrub through a song - you have to press and hold on the FF/rewind buttons to simply jump back and forth. The video player in Windows Phone 8 has greatly improved codec support since the GDR2 update. Now it supports XviD, DivX, MOV and MP4 videos up to 1080p resolution. The few things it won't play are MKV files and videos using the AC3 audio codec. There is no subtitle support at this point. There's an FM radio on board the Lumia 1520, thanks to the Lumia Amber firmware. You can use the loudspeaker for the FM radio, though you still need the headset connected as it doubles as an antenna. To enable the loudspeaker playback, just tap and hold on the station and select the appropriate option. 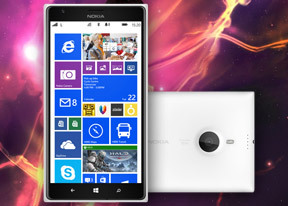 The Nokia Lumia 1520 isn't the cleanest, but it's among the louder phablets out there when it comes to audio output. The first Nokia phablet did very well in the first part of our test, posting excellent scores top to bottom and garnishing them with above average volume levels. 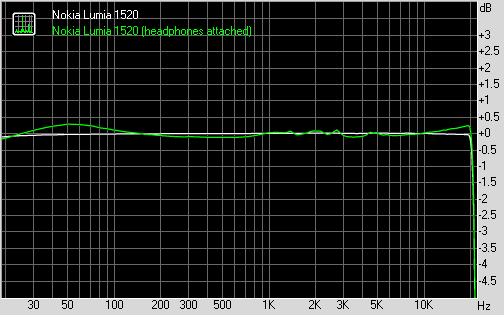 Things aren't quite as spotless when you plug in a pair of headphones - some extra stereo crosstalk sneaks in, the frequency response deteriorates slightly and some distortion appears. The readings are still good, just not the best in class. The volume doesn't drop at all, though, which makes it excellent for this testing scenario.